A - A sense of anticipation. Could the championship actually be a contest? Kerry, Mayo, Galway and Tyrone all had their moments as the Dubs faltered. Either that or Jim Gavin is cruelly toying with our emotions. B - Broadcast of more games free to air can only be a good thing. TG4 were, as always, top class and RTÉ had some cracking games. To the cynics who say that’s self indulgent we say damned if you do and damned if you don’t but the audience can decide and they welcome the games. C - Cork ....oh Cork, the third tier beckons nine years after Sam. The Kieran O’Connor story gives a context and a reality check but the Rebels need more than a five-year plan. 'Corkness' whatever that is - try a steely resolve, unity and a greater work ethic. D - Dublin. The greatest team of all time? League defeat is surely part of a cunning plan. Let the others think they can win? (Cough) Even in Croke Park? (audible laugh), let those currently in the jersey think they can take their foot of the pedal? Let Jim wield the axe? Let the five-in-a-row quest begin in earnest. E - Equality - if the league proved anything it proved the value in teams of equal quality, resources, and belief competing against each other providing thrilling entertainment. Tiered championship anyone? F - Footwork. Remember the days when we thought it was four steps between solos and bounce. It still is unless you are running at goal. Green light now for seven, eight, nine steps. Run, Forrest, Run! G - Girls, Ladies, Women....whatever the LGFA want to call them but how damn good is it to see co-ordination whereby they play before the men’s games. It’s possible, it’s pervasive and it’s definitely progress. H - Horan. He came back for Sam but already has Mayo contesting a league final. Has uncovered new options in Ruane, Meade and McDonagh. Shrewd and smooth operator. I - Indiscipline. Anthony Cunningham will look back at the eye gouging and the stupidity of the indiscipline that cost Roscommon a point against Tyrone. He can only hope his players learn. They were not the only guilty party but their misdemeanours certainly came at the highest cost. J - White men can’t JUMP. Yeah they can and when we kick the ball as in 'football' we can see the great exponents. Tommy Walsh against the Dublin full back-line. You heard it here first. L - Larry Cunningham take a bow. Lovely, lovely Leitrim. Promotion and a date in Croke Park for Emlyn Mulligan et al at long long last. A county bursting with pride and there on merit. Now what’s the word, oh yeah, lovely. M - Mark, the offensive kind was actually of the progressive kind. 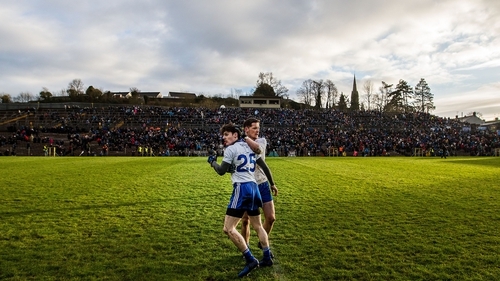 From day one Monaghan showed its potential and the beauty of the long ball. Tommy Walsh and Conor McManus took it to another level. Sadly it hibernates now but we eagerly await its return. N - Niall Morgan - the good and the bad. Super scores with the outside of the boot but that hit on Paddy Andrews wasn’t just ill-timed, it was ill-judged and the Dubs have long memories. O - Oh God, this O’Shea kid is good. Sean O’Shea not only stepped up, he thrived, he excelled, he thrilled. Long may this kid reign. P - Páirc Uí Chaoimh - sandy and shambolic. Enough said. Q - Quality aka Michael Murphy. His return heralded the turbo charge to Division 1 for Donegal. R - Royals return to the top table. The Leinster Championship may need a strong Meath but Andy McEntee take a bow. You have given your county a seat at the top table but more importantly a sense of pride if not expectation. S - Scores and loads of them. To the prophets of doom who decry the game we give you Sean O’Shea, Michael Murphy, Conor McManus, Peter Harte, Shane Walsh, Ryan O’Rourke, give them a ball and a yard of grass. We salute you all. T - Tralee had two defining moments. The Kerry-Dublin match gave a glimpse of the better game football can be. It didn’t rescue football but it showed light in the tunnel. Mayo’s victory there then showed they haven’t gone away you know. V - Value for money. Anyone still remember the ticket price controversy. Buy your tickets online they said, save money, they said. It’s going to the clubs, they said. So in truth is the league better value than the Championship? Yes, said everyone. W - The Irish weather. Try telling the CCCC there is global warming in February-March. In truth only one game was lost but the condensed calendar is dancing with the devil. X - Xpectation, yes we know that’s cheating but a Division 1 final without Dublin, a Division 2 final with Meath and a Division 4 with Leitrim will undoubtedly create a sense of expectation, exhilaration and good old fashioned excitement. Y - YO-YO. See Roscommon and Cavan. Tier one is tough but you gotta stay there, lads. Z - Zeal, the byword for how Clare approached their defining game with Tipperary. Others condemned them to relegation but the Banner wrote their own script and stayed in Division 2. Three Munster teams at the bottom of tier 2 is worrying for the province but take nothing from Colm Collins, Tubridy, Brennan and co.